It's part of a project to make the area safer for pedestrians and bicyclists. 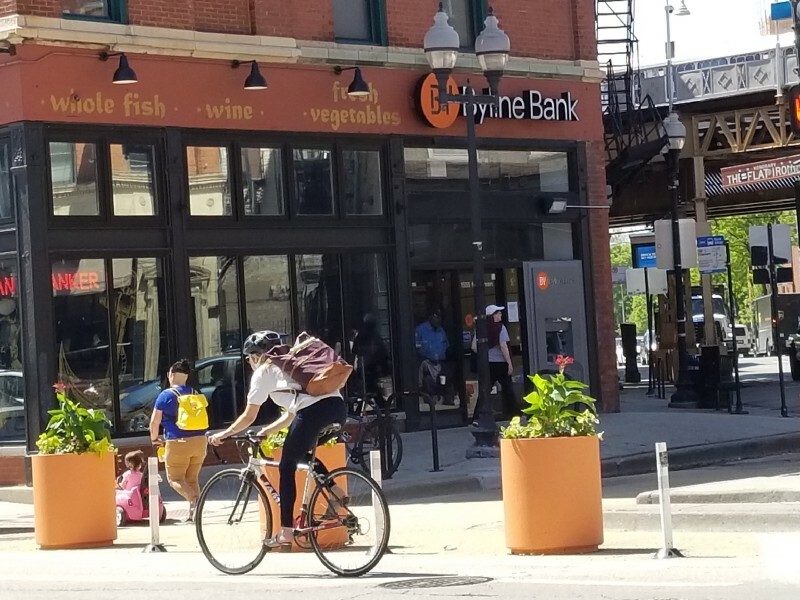 WICKER PARK — The “Hipster Highway” stretch of Milwaukee Avenue in Wicker Park is now lined with flowers in big, can’t-miss, bright orange concrete planters. 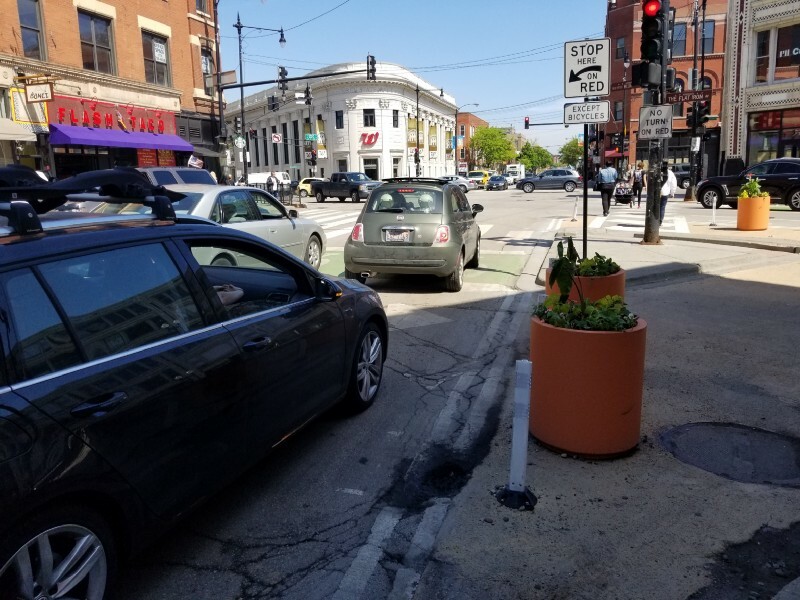 The 32 planters, made of solid concrete and weighing 500 pounds each, were installed earlier this week as part of an ongoing pilot program to make several Wicker Park intersections safer for pedestrians and cyclists, according to Samantha Choudhury, program manager for Special Service Area Taxpayer District №33. 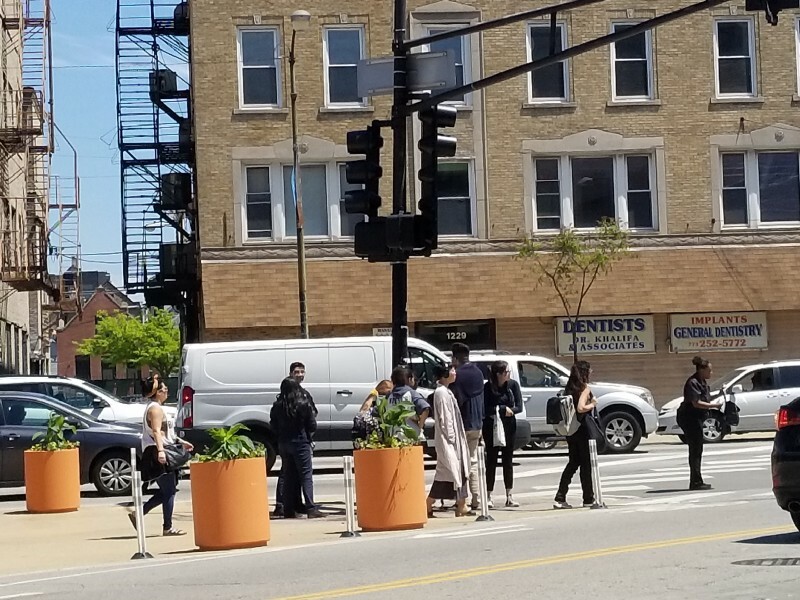 The taxpayer-funded group, which brands itself as “WPB,” paid $11,500 to vendor BrightView for the flowers and maintenance and $14,000 to vendor Doty & Sons for the planters, installed at various intersections along a 1.2-mile strip of Milwaukee between Ashland and Western avenues. Planters at Milwaukee and Wabansia. 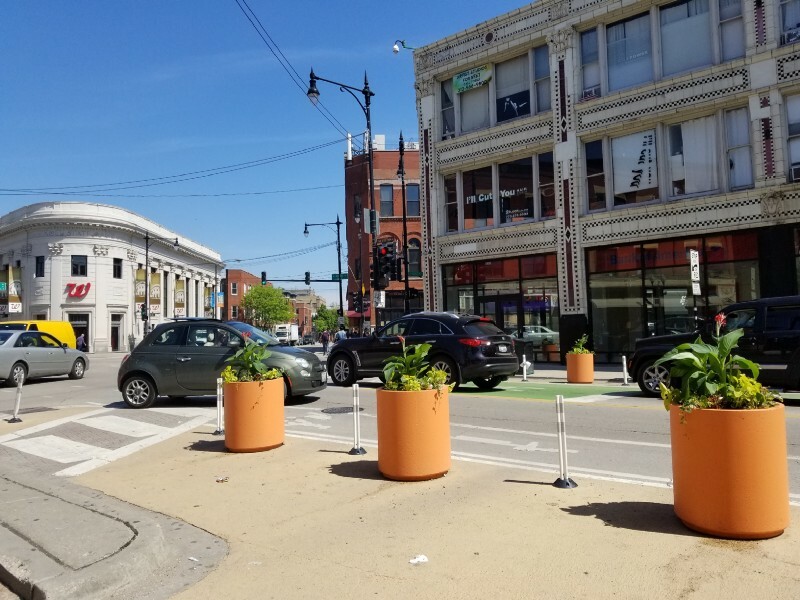 Choudhury said the planters will be on the street for the next 12 months and the Chicago Department of Transportation plans to monitor the program and get feedback. The group got permits to install up to 90 planters but are starting with 32, she said. “We would love to hear people’s thoughts and feedback on it. We think it makes the area look more vibrant, but we welcome all sorts of feedback,” Choudhury said. Choudhury said planters are often used as “a traffic calming method” to engineer behavior changes in car drivers. “[Planters] help to calm traffic and keep pedestrians safe from potential mishaps,” she said. A planter further blocks cars from trying to enter a right-turn “slip lane” that was closed off to drivers last year. 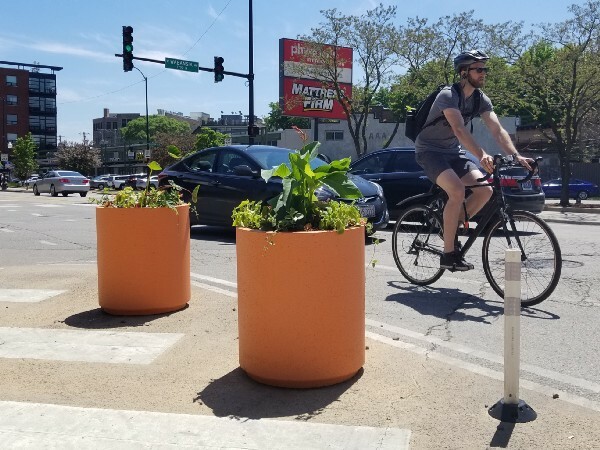 Pedestrians get an extra layer of protection from new concrete planters at Milwaukee and Ashland. 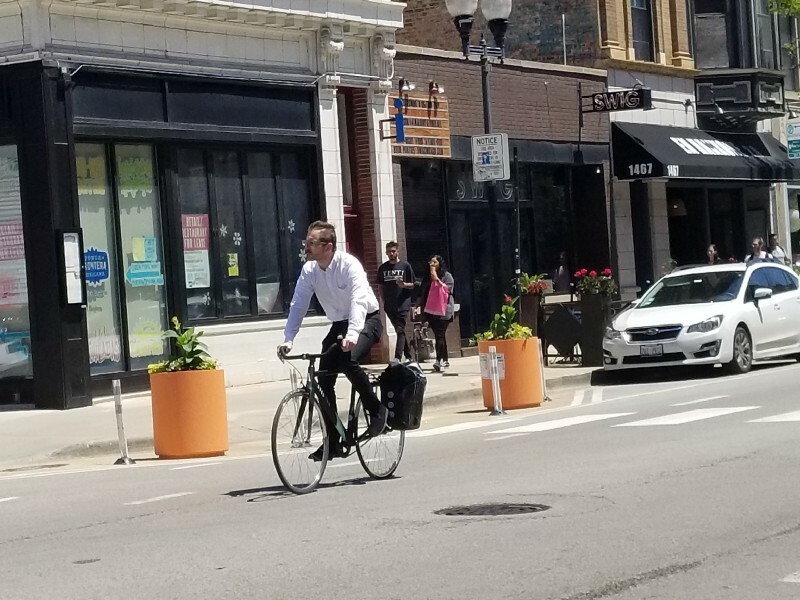 A cyclist passes new planters in front of the former Fonda Frontera. Three planters at the southwest side of the Milwaukee and Damen avenues intersection.